There are many inspirational stories being passed round on the net via email. Some of them are very heartwarming and have meanings to them. They make you feel good and give you warm fuzzy feelings. Then there are others that make you stop and think about things. I have saved some that I like and thought I would share them with you. I have no idea who wrote these inspirational stories so am not able to put any names to them. If an author is known I am happy to add it of course. What's interesting about inspirational stories is that sometimes we can relate personally to them. 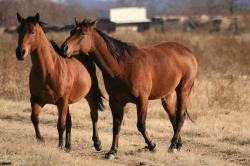 A friend of mine owns a horse, and in the paddock next door to where her horse is kept, are two horses. One of them is blind, and although the other one does not wear a bell, he does seem to watch out for his friend. Just up the road from my home is a field, with two horses in it. From a distance, each looks like every other horse. But if you stop your car or are walking by, you will notice something quite amazing. Looking into the eyes of one horse will disclose that he is blind. His owner has chosen not to have him put down but has made a good home for him. This alone is amazing. If nearby and listening, you will hear the sound of a bell. Looking around for the source of the sound, you will see that it comes from the smaller horse in the field. As you stand and watch these two friends, you'll see how she is always checking on him, and that he will listen for her bell and then slowly walk to where she is, trusting that she will not lead him astray. Good friends are like this. You don't always see them. Please listen for my bell and I'll listen for yours. What a wonderful inspirational story. This inspirational story has lots of good advice. You'll fight with your best friend. You'll blame a new love for things an old one did. You'll cry because time is passing too fast, and you'll eventually lose someone you love, but you know they are always there. When you read this inspirational story through to the end you will see things are not always what they seem. "Then last night as we slept in the farmers bed, the angel of death came for his wife. I gave him the cow instead. Things aren't always what they seem? Did you know that the three most difficult things to say are: I love you, Sorry, and Help me. Did you know that when you help someone, the help is returned in two-fold? Did you know that it's easier to say what you feel in writing than saying it to someone in the face? But did you know that it has more value when you say it to their face? Did you know that you can make your dreams come true, like falling in love, becoming rich, staying healthy, if you ask for it by faith, and if you really knew, you'd be surprised by what you could do. But, don't believe everything I tell you, until you try it for yourself, if you know someone that is in need of something that I mentioned, and you know that you can help, you'll see that it will be returned in two-fold. There are many types of inspirational stories about different subjects. Its surprising to me how many of them hit home and mean something. Sometimes when you are feeling low inspirational stories just seem to make the day a bit brighter don't you think?